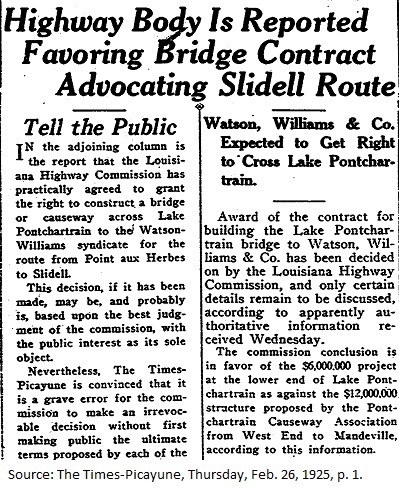 The Times-Picayune reported substantially on updates regarding two bids before the Louisiana Highway Commission. Sometimes the paper printed multiple stories in one day, from late 1924 until a decision was made in February 1925. 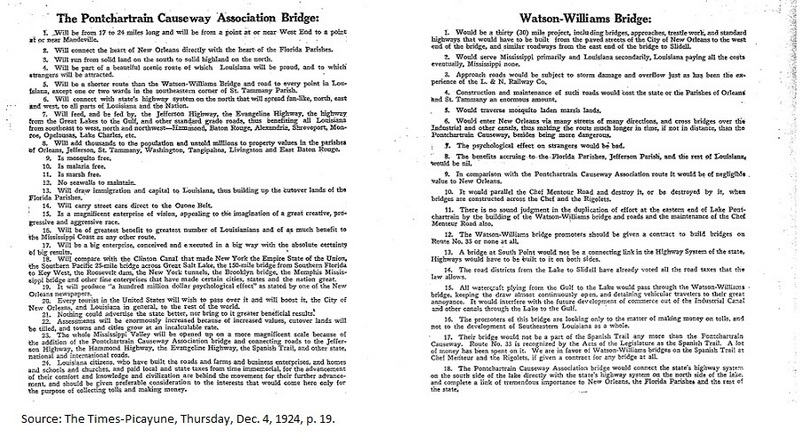 One proposal had the bridge crossing Lake Pontchartrain at the West End, a 23-mile stretch to Mandeville in St. Tammany. 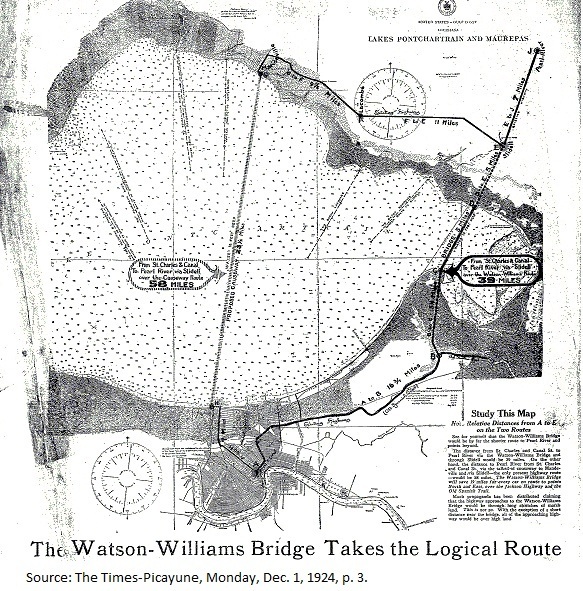 The other, proposed by Watson, Williams, and Company, had the bridge crossing the Pontchartrain at a narrower path, from an area known as Little Woods in eastern New Orleans into Slidell. The latter required only five miles of bridge over the Lake, but an additional 10 miles of approach would also be needed. And Why the Watson-Williams Proposal is Inferior: A heated and at times contentious battle for public opinion lasted during months of deliberation by the Commission over the two proposals, according to Times-Picayune articles and editorials. Groups favoring one or the other consistently used the paper in attempts to drum up support. This excerpt exemplifies how ridiculous some of the attempts were, particularly considering that the public had little or no sway over the Commission's decision. Graham Cooper, “Pontchartrain Causeway Assoc. 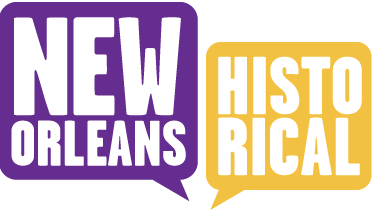 vs. Watson-Williams & Co.,” New Orleans Historical, accessed April 24, 2019, https://neworleanshistorical.org/items/show/347.